Client: Faced with a plain looking facade on a row of gingerbread cottages, client considered at first remodeling to fit with neighbouring houses. After seeing and admiring Nicolai's work, client decided for the fresh approach with a painted mural. 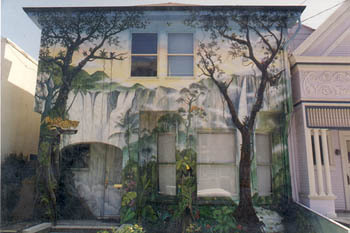 After consultations with Nicolai, they chose the theme and watercolor style for the full facade mural. Location: on Church Street between 22nd and 23rd Street, San Francisco, CA. Specifics: 20'x20'. Varnished acrylics on masonry.